Migration is a Human Right! We March for Dignity and Justice! On May 1, the Justice for Immigrants Coalition of Inland Southern California (JFIC) will hold a march and rally in Murrieta. We want to invite all of our community members to be there and march alongside with us. 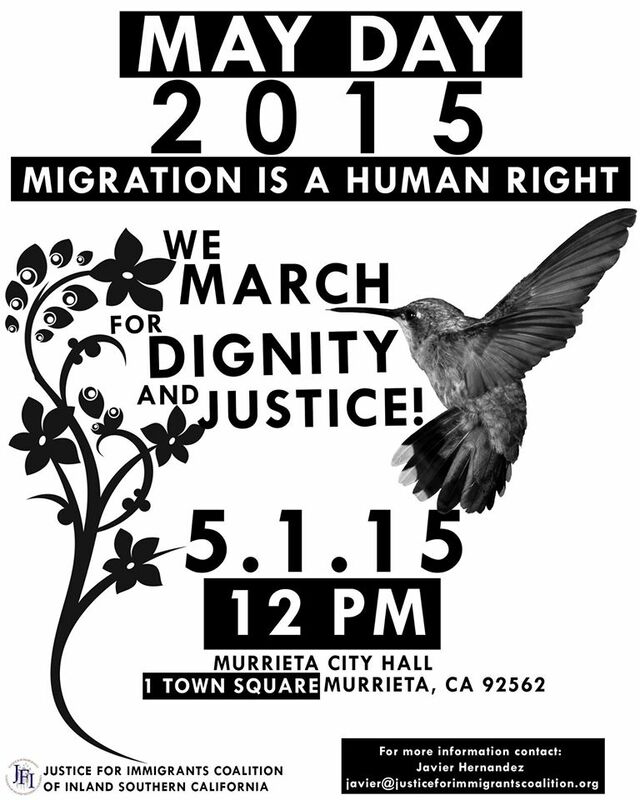 We will meet at the Murrieta City Hall and begin our march at 12pm. For those in need of transportation, there will be a bus leaving from the UFCW Local 1167 offices in Bloomington, CA and traveling to Murrieta making stops along the way.The Pomona Economic Opportunity Center will also provide a van to transport those interested in participating. The PEOC is located on Mission Blvd. near the 71 freeway. La Migracion es un Derecho HUMANO! El Primero de Mayo, la Coalición Justicia Para Inmigrantes tendra una marcha en la cuidad de Murrieta. Queremos invitar a miembros de la comunidad que marche junto a nosotros. Nos reuniremos en el municipio de la ciudad de Murrieta y empezaremos nuestra marcha a las 12.Para aquellos en necesidad de transporte, habrá un autobús que saldra desde las oficinas del sindicato UFCW 1167 en Bloomington , CA y viajara a Murrieta haciendo paradas en el camino .El Centro Jornalero de Pomona también proporcionará una van para transportar a los interesados en participar . El PEOC se encuentra en Mission Blvd. cerca del 71 autopista. Por favor, estar atentos aqui para más detalles. I would like to thank all that came out yesterday. We went to Murrieta to show our support to the undocumented population there. We brought a strong presence. The anti-immigrants were maybe only 10 people versus our couple hundred. We showed that we were not only the better organized, but we are not afraid of them or their threats. it was definitely a victory that can be added to our many that we’ve won as of late. Deportations are dropping for the first time since Obama has taken office. While we are far from getting true immigration reform, we should be proud that our efforts have been making a huge impact and we should continue to organize. Videos and photos of our time in Murrieta to come.